Beautiful handcrafted dark Copper Color Small Wooden Mandir for home. All hand carved in traditional design that reflects the artisan workmanship in India. The temple has a drawer at the bottom to store your daily puja / aarti samagri. 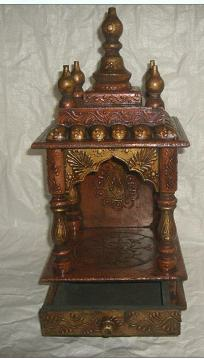 Made from teak wood, this mandir is great for home or office when you do not have a lot of space. Ideal as a housewarming or wedding gift as well. Copper color hand carved small Wooden Mandir 8"
This item in Puja Mandir for Home category was first added to our catalog on 03-15-2017. Buy Small Wooden Mandir Hand Carved Copper Color - 8", sold & shipped by Sangu Enterprise Ltd where you can shop online for Indian Restaurant Supply, Pooja Mandir, Handicrafts, Utensils & Gifts. This Small Wooden Mandir collection has been tagged as Wall Hanging Mandir, Religios Gift, Spiritual, Devotional Mandir, Temple, Wooden Altar, Puja Ghar. Can it be hanged on wall ? It does have hooks on the back to hang on the wall. It does not come with any additional hardware though.